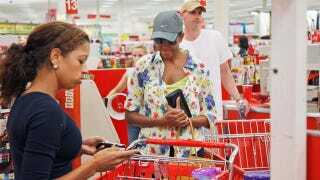 Last week, the Associated Press released photos of Michelle Obama shopping in Target. That doesn't fit with modern day Marie Antoinette image conservatives have constructed for the First Lady, so now they've decided that the entire thing was a calculated photo op. Apparently a woman who's vacationed in Europe and worn borrowed diamonds would never shop with commoners unless she had some ulterior motive. According to the Washington Post, Sean Hannity of Fox News Tweeted, "First Lady Michelle Obama shopping at Target with an AP photographer in tow . . . . planned? I think so." Rush Limbaugh translated that sentiment into unintelligible blowhard, declaring, "What a phony-baloney plastic banana good-time rock-and-roller optic photo op." To be fair, the circumstances in which the photographs were taken are a bit of a mystery. Obama is wearing a disguise with no entourage in sight (though we wouldn't be surprised if the other shoppers in the photos were in the Secret Service. If we were on a checkout line with Obama, we'd be too busy wetting ourselves to check out our two cell phones.) Yet it seems like AP photographer Charles Dharapak managed to position himself about six feet away from the First Lady. No other photographers were present, and neither the White House nor the news agency will explain how he got the shot. An AP spokesman said, "All I can say is that it was the result of good source work on his part." Obama's spokeswoman responded, "It is not uncommon for the First Lady to slip out to run an errand, eat at a local restaurant or otherwise enjoy the city outside the White House gates." It is uncommon for a photographer to come along, but there still isn't strong evidence that the entire trip was concocted just to make Obama seem more sympathetic. Since she stepped onto the national stage, Obama has mixed designer clothing with pieces from stores like Banana Republic, J.Crew, and Ann Taylor. Someone at the White House may have tipped a photographer this time, but that doesn't mean she'd never slip out to Target when there are no cameras around. Earlier: What's In Michelle Obama's Target Bags? What&apos;s In Michelle Obama&apos;s Target Bags?